The Southern Appalachian Railway Museum is extremely pleased to announce that we have been granted $10,000 from the John Emery Rail Heritage Trust for continued restoration work on the Central of Georgia Fort McPherson passenger coach. The grant is a tremendous boost in project funding and will greatly help restoration work. Volunteers have been working on cleaning out the car, removing walls and getting new spray foam insulation added. Old 32V DC switchgear has been removed, along with copper steam radiators. We acquired new (to us) seats and frames, and are planning on painting replacement wall panels soon. This grant from the John Emery Rail Heritage Trust will help us get HVAC systems installed and updated electrical work done on the car. The museum owns the sister car, the Fort Oglethorpe, and finished restoration on the car approximately 3 years ago. Museum Director Charlie Poling and his wife, plus museum volunteer Wade White ride the Santa Train. Peyton Gupton photo. SARM Volunteers and friends that chased the Santa Train. Mark Glucksman photo. Some of the CSX employees involved in the fantastic restoration of CRR 800. Mark Glucksman photo. While the Secret City Excursion train operations have ceased, the Southern Appalachia Railway Museum continues its mission of preserving and restoring historic railroad equipment. With the generous help of CSX, Inc., SARM was able to get the Clinchfield 800 F7 beautifully restored. In addition, the SD45 engine got some needed upgrades. These two engines were then the power that pulled the historic 75th annual Santa Train from Shelby KY to Kingsport TN. Many SARM volunteers spent countless hours getting ready for this event. 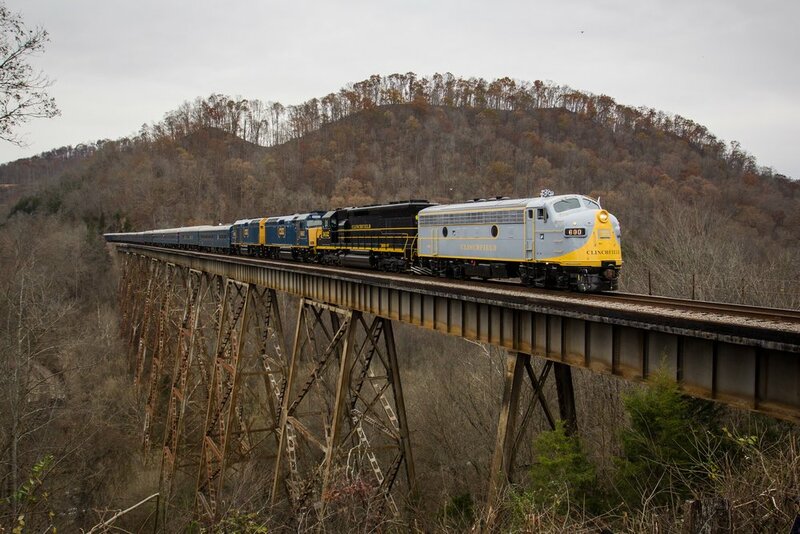 We are very proud to have been a part of such a great cause/event and hope to continue working with CSX, Inc. and the rest of the railroad community to continue preserving and restoring equipment while we looking for a new home for running excursions. 5) Other on-going expenses such as maintaining our website, etc. We are working on an online donation button, but in the meantime, donations can be mailed to SARM Donations, P.O. Box 6756, Oak Ridge TN, 37831. If you would like a receipt or to have your donation go to a specific item, please let us know.